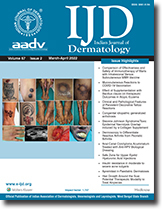 Autologous miniature punch grafting with certain modifications was taken up in 54 sites in 30 patients with stable vitiligo for 6 months or more. The modifications were: (a) use of same sized disposable punches for both donor and recipient areas except over convex body surfaces, (b) use of Castraviejo's scissors for harvesting donor grafts, (c) use of medial side of thigh as donor site and (d) not removing the primary dressing of the recipient site till 8 postoperaive day. The patients were given systemic PUVASOL after the procedure for a period of three months and mean pigment spread was noted at each site. Results showed that the extent of repigmentation varied among the recipient sites, the maximum being over upper eyelids, axillae and umbilicus. The modifications in the standard procedure were found to produce less complications, like cobblestoning, graft rejection. 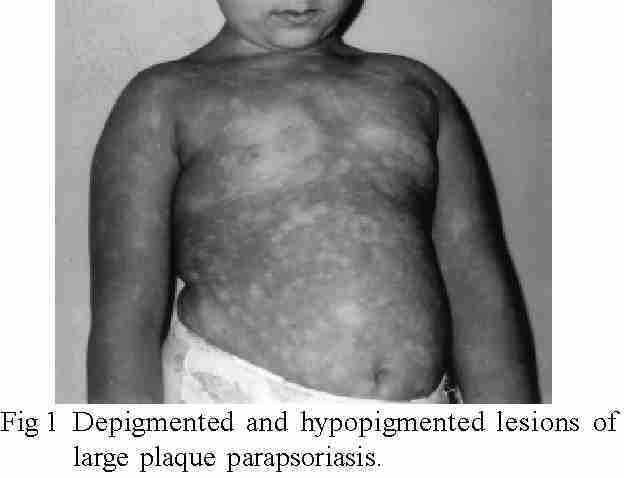 The association of psoriasis with hepatotrophic viruses B and C (HBV& HCV ) infection has been reported with conflicting results in literature .This association has never been investigated in Kashmir where the prevalence of psoriasis in the general population varies from 2.4 to 3.4 % and the epidemiology of chronic liver disease reveals infection with HBV and HCV to be causative in 25% and 45% of the cases respectively. The aim of this study was to determine the prevalence of HbsAg and anti- HCV antibody amongst Kashmiri patients with psoriasis. Fifty Kashmiris with psoriasis (study group) and fifty apparently healthy persons coming forward for voluntary blood donation to the hospital (control group )were screened for the presence of HbsAg by Monolisa Ag HbsAg one step enzyme immunoassay technique .The serological estimation of HCV was done by HCD 3.0 in vitro enzyme immunoassay for detection of anti HCV antibody in the serum. Two (4%) of the 50 patients in the study group were sero­positive for HbsAg and one (2%) for anti HCV. Seven (14%) of the control group were sero-positive for HbsAg and none (0%) for anti HCV. 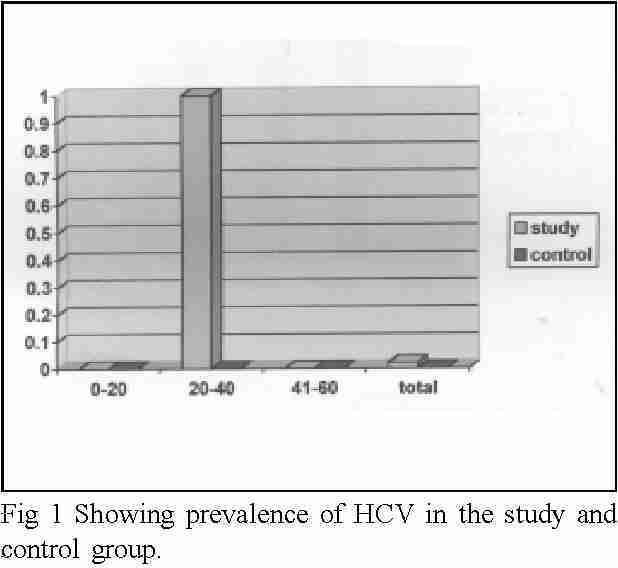 The prevalence of HbsAg in the study group comprising Kashmiri patients of psoriasis was lower than in the control group of voluntary blood donors whereas the prevalence of anti HCV was 2% in the study group against nil in the control group.Using the Chi-square test for analysis of data, the null hypothesis applies.It would appear that the prevalence of HbsAg and HCV infections in psoriasis is not statistically significant. One hundred and seven cases (6 children and 101 adults) of herpes zoster were recruited over a period of two years. The frequency of herpes zoster amongst skin OPD cases was found to be 0.34 per cent. The male to female ratio was 1.74:1. The most common prodromal symptom seen was paresthesia in 25 (23.36%) cases followed by itching in 21 (19.62%) cases.Most common presenting complaint was pain in 97 (90.65%) cases. Ninety nine cases had classical herpes zoster followed by necrotic / ulcerated herpes zoster in 5 cases and hemorrhagic herpes zoster in 3 cases. Thoracic dermatome was the most common dermatome involved in 64 (59.8%) cases followed by cervical in 17 (15.8%) cases. Unidermatomal involvement was seen in 81 (75.7%) cases, followed by multidermatomal in 18 (16.8%) cases and disseminated in 8 (7.4%) cases. Forty six cases were screened for HIV, out of them; six cases (4 males, 2 females) were seropositive for HIV. Classical herpes zoster was a feature in four cases; however, one case each also had necrotic and hemorrhagic form of herpes zoster. To conclude, herpes zoster commonly occurs in young adults in India with presenting symptoms such as pain, itching and fever. Scant epidemiological studies have been carried out on the prevalence of skin diseases in population of Iran. This study was performed to assess the prevalence of skin diseases in the of rural areas Hamedan, in the west of Iran in 2002. A cluster random sampling was followed. The survey included 9450 rural inhabitant of all ages and both sexes from representative of 33 villages of Hamedan governorate in the west of Iran. The data were collected through personal interview and examination at homes in 2002. This study showed that overall prevalence of skin diseases is 27% and dermatitis by 37.5%, disorders of skin color 36.3%, actinic disorders 16.5%, nail disorders 13% and acne 11.7%. They were the five common diagnoses. Incidence of skin diseases in Hamedan province is high and is one of the public health problems that need planning for reduction of size of these disorders and its burden on community as a whole. Five patients with biopsy documented chronic actinic dermatitis were treated with PUVA therapy during spring and early summer. Out of these, only one patient remains in remission till date while the other patients relapsed after an average duration of two months. Carcinoma cuniculatum, a low grade squamous carcinoma of plantar skin was first described in 1954. Even after 50 years, biopsy errors are common with delay in diagnosis. Clinico-morphologica1 features in 12 patients of carcinoma cuniculatum, in a period of three and a half years are studied. The aim is to draw attention to the sites of occurrence of this tumor other than the sole and to have better understanding of the diagnostic difficulties. 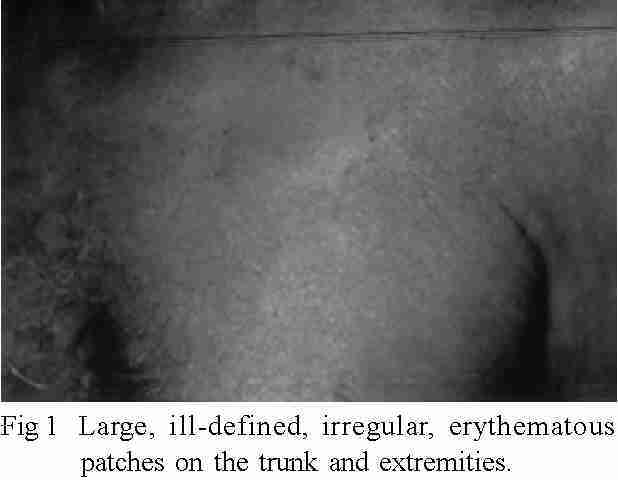 The sites of occurrence of these tumors according to frequency were foot followed by flank, leg, face and palm. The tumors presented with ulcerated, fungating masses with fine papillary architecture. Microscopic examination of the tumors revealed bulbous acanthosis, parakeratosis and a well defined lower border, circumscribed by chronic inflammatory cells. No lymph node metastasis were recorded in any of the cases. Wide local excision with at least five mm free surgical margin was the treatment of choice. A transmetatarsal and above wrist amputation was required in two patients. Carcinoma cuniculatum should always be suspected in a nonhealing ulcer or verrucous growth of long standing duration. Superficial and small biopsies are unsatisfactory. Benign appearance on histopathology of this tumor needs to be interpreted in proper clinical settings. A case of large plaque parapsoriasis with extensive skin lesions is presented for its unusual clinical features. The controversial issue of its nosological position is discussed as it has a considerable impact on the management of such cases. Lichen planus pemphigoides is a rare, controversial disease which is thought by majority to be a concurrence of bullous pemphigoid (B P) and lichen planus (LP) with clinical, histological and immunological features suggestive of both. 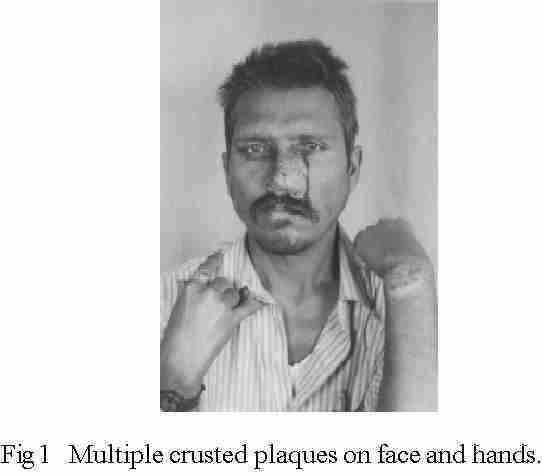 We describe LP pemphigoides in an Indian female who had classical LP with subsequent short lived bullous eruption over the lesions of LP and the normal skin. DIF of the bulla showed C3 and lgG along the basement membrane zone ( BMZ) linearly. She responded successfully to systemic steroids (short course of 6 wks prednisolone 40 mg/day for 6 weeks) and dapsone 100mg per day. Mycosis fungoides (MF) is a malignant lymphoma, primarily of the skin and is characterized by infiltration of the skin by atypical T-cells which have a tendency for epidermotropism. Hodgkins disease (HD) is considered to be a malignant lymphoma affecting predominantly the lymph nodes and characterized by presence of Reed­ Sternberg cells on histopathology, though, the exact origin of the Reed Sternberg cell and the nature of the malignant cell is not known yet. Few cases of association of mycosis fungoides with Hodgkin's lymphoma have been reported in the literature. It was reported in the past that when mycosis fungoides spreads to the lymph nodes and other viscera it frequently gets transformed into a more common lymphoma like Hodgkin's lymphoma. However it has now been proved that the two malignancies are distinct and that such patients probably have a tumour diathesis. 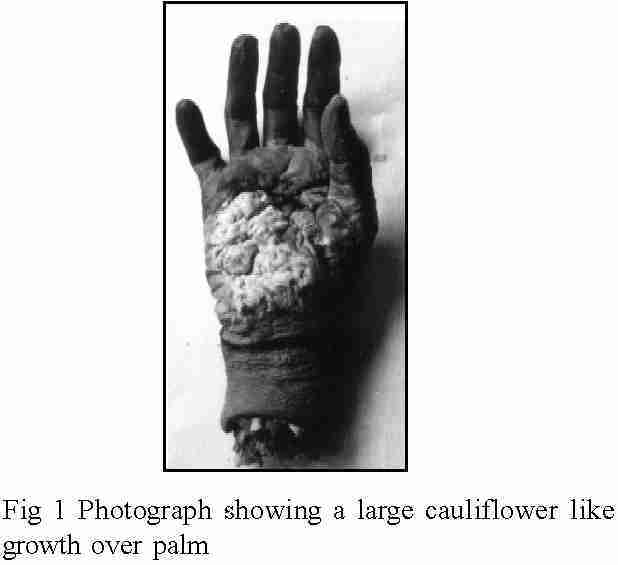 A 22 year old female presented with asymptomatic papules, pustules and crusted lesions appearing in crops over the extensor aspect of both upper and lower limbs, palms and soles and sun exposed part of the back. 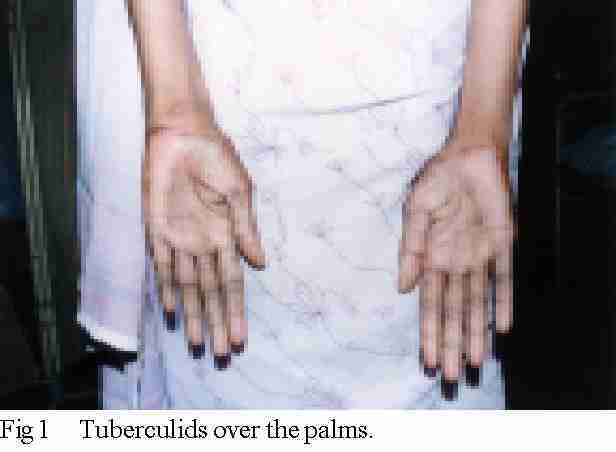 She also had hypopigmented atrophic scars over the extremities and hyperpigmented macules on palms and soles. She had not responded to topical antibiotic creams and broad spectrum antibiotics in the past. VDRL test was non-reactive and the results of skin biopsy and Mantoux test were suggestive of papulonecrotic tuberculid. She was treated with antitubercular therapy and appearance of new lesions stopped within 4 days.